The acquisition of real estate in Mexico by foreign citizens requires adherence to strict formalities established by the Mexican constitution, laws, and civil law tradition. Foreigners who acquire property in Mexico without abiding by these formalities and laws run the risk of losing their investment and being subject to fines and penalties. Moreover, the Mexican title system is not as technologically advanced as its counterparts in developed countries. Title reports from public registries may sometimes be unreliable or inaccurate, and these offices in almost all states lack computer filing systems or records—thereby making them vulnerable to human error and corruption. Traditionally, the Mexican Notario Público—a quasi-public official who attests to the legality and authenticity of the transaction—has played the most important role in ensuring the transfer of clean title. However, many major US title insurance companies now offer coverage in Mexico. This coverage is welcomed by foreign buyers because it provides them with recourse and indemnification in the event a title dispute were to surface. Foreign buyers of real estate in Mexico should also make sure they are represented by competent legal counsel or a closing company familiar with Mexican law and local real estate practices. In choosing your closing attorney or agent, you should also be sure that no conflict of interest exists. Article 27 of the Mexican Constitution grants ownership of Mexico’s land and water to the Mexican nation, which also has the power to transfer ownership rights over such properties to private individuals, thereby creating private property. The constitution further stipulates that foreign citizens may, in general, acquire dominion over land provided that they agree, before the Secretariat of Foreign Affairs, to consider themselves as Mexican nationals with respect to such property and not to invoke the protection of their home government in the event of controversy. If this pact is violated by the foreigner, all rights to the property shall revert to the Nation. Commonly found in Latin American counuse, Article 27 further restricts the ability of foreigners to acquire property in Mexico by prohibiting their direct ownership of land within the “Restricted Zone”.tries, this constitutional provision is referred to as the “Calvo Clause”. In addition to the Calvo Clause, Article 27 further restricts the ability of foreigners to acquire property in Mexico by prohibiting their direct ownership of land within the “Restricted Zone”. The “Restricted Zone” encompasses all land and water located within 100 kilometers of any border and 50 kilometers of any sea. No foreigner may acquire direct title over real property within the Restricted Zone. Foreigners wishing to acquire beneficial ownership of property located in the Restricted Zone for residential purposes must establish a Mexican trust or fideicomiso. The trust is a three-party contract through which the seller (fideicomitente/trustor) irrevocably transfers title to real property to a Mexican bank (fiduciario/trustee) so that the foreign citizen (fideicomisario/ beneficiary) can use and enjoy the property and dispose of it if and when desired. Although the trust agreement will vary from trustee to trustee, some of the provisions found in most agreements are outlined below. The foreigner holds beneficial and equitable title to the land while the Mexican bank holds legal title. Prior to constituting the trust, a permit must be obtained from the Secretariat of Foreign Affairs. The trust will be in force for 50 years and may be renewed for an equal period at the request of any beneficiary. The bank cannot restrict the manner in which the beneficiary uses and enjoys the property, as long as the manner in which he does so is lawful. The bank cannot encumber, securitize, or sell the property without the express written consent of the beneficiary. There can be more than one beneficiary. If more than one beneficiary is designated, each will be a co-beneficiary (like tenants-in-common) of the property held in trust (unless otherwise established) and thus they must jointly consent to any transactions relating to the trust and/or property. Substitute beneficiaries must also be designated. Substitute beneficiaries are usually family members and will have the right to participate in the trust only when all of the first beneficiaries have died (unless otherwise established). The designation of secondary beneficiaries is particularly important because it will prevail over contrary stipulations in the primary beneficiary’s will. If the beneficiary wishes to rent the property to third parties, she must first obtain authorization from the Secretariat of Foreign Affairs unless the authorization is already included within the original trust agreement. The beneficiary is free to sell the beneficial interest in the property to another foreigner through an assignment of rights, or transfer title outright (and thereby extinguish the trust) to any Mexican person in accordance with law, subject to the provision of written instructions to the trustee and other formalities. If the beneficiary is dissatisfied with the bank that is acting as trustee, the beneficiary has the right to change trustees. If the property held in trust is unimproved land and larger than 2,000 square meters (roughly ½ acre), the Secretariat of Foreign Affairs will require that the beneficiaries sign a letter promising to invest a certain amount of money in the land over a 24-month period. The amount of money that must be invested will be determined by the location of the property and its size. Because the company is incorporated under Mexican law, it is a “Mexican entity”, even if its shareholders, members and officers are foreigners. Accordingly, the company may acquire direct ownership (including legal and beneficial title) over Restricted Zone property. Like the trust beneficiary, the Mexican corporation must include the “Calvo Clause” in its articles of incorporation and must provide notice to the Secretariat of Foreign Affairs upon acquiring land in the Restricted Zone. Incorporating and maintaining a Mexican company is more costly than establishing a trust and it must be operated in accordance with law. Therefore, unless the buyer plans to develop the property or an associated business, the trust mechanism is the easier, less costly approach. Title disputes under which more than one individual allegedly holds colorable title to the property (including claims of squatters, agrarian landowners or ejidatarios, government, or others claiming title or possession of the same land). Prior to entering into any agreement or contract of purchase (including through a trust), the buyer is advised to request, at a minimum, the following documents from the seller: copies of the existing publicly recorded deed, power of attorney, a Certificate of Clean Title, proof of property tax and utility payments, and the municipal blueprint of the property. The buyer may also wish to research the chain of title to ensure that the seller acquired lawful title from the previous owner and that there are no competing claims to the property. If the seller obliges, a common way for the buyer to protect himself while not losing out on the purchase opportunity is to enter into a promise to purchase agreement prior to finalizing the sale. This agreement is often called a “Promissory Purchase Agreement” or “Promise of Trust”, and can also be in the form of an “Option Contract”. In tourism centers where foreign buyers predominate, “Offers” are also used and may be binding, but it is essential that the Offeree sign and accept the same document signed by Offeror; otherwise, a court might conclude the agreement lacked proper consent. Providing proof of (i) proper zoning and land use specifications, municipal blueprints, and tax and user fee payments; (ii) property tax and municipal user-fee payments; (iii) the existence of applicable permits, licenses and concessions, such as tourism authorizations, water rights, and the Federal Maritime Zone Concession (i.e., beach use); (iv) providing proof of signing authority. If the conditions are met, the buyer must pay the balance (or forfeit the deposit), and the parties then formalize the conveyance. If the conditions are not met, the buyer is refunded the deposit and the deal is void. Buyers should be cautioned against giving deposits or down payments without first signing such a contract, or at least a carefully drafted and accepted Offer Agreement. Executing the trust or purchase and sale agreement (thereby transferring title) before a notario público, who, through the issuance of a Public Deed will formalize the conveyance, attest to the legality and nature of the transaction, the status of the parties and the authority of their representatives, and the validity and authenticity of the signatures. Recording the transaction in the public property registry of the jurisdiction where the property is located (typically done by the notario público or a closing company). Paying any applicable taxes and fees. Both the seller and buyer are liable for taxes upon the conveyance of real estate in Mexico. 31¹ percent tax on the net capital gain (including inflationary adjustments). In the case of individual sellers (as opposed to corporations) the notario público is responsible for calculating the income tax and including it in the public deed. The notario público must withhold the applicable tax from the purchase and pay it to the Secretariat of Finance (Hacienda) within 15 days following the execution of the deed. Any other applicable taxes according to state law. The same rules apply if the property is transferred by an outright purchase and sale between two parties, by assigning the beneficial rights under a trust, or by extinguishing and creating a new trust. On the other hand, no taxes are due if the trustor and beneficiary are the same, or if the property is settled into trust simply to appoint a guaranty beneficiary (guaranty trust) as a mechanism to secure a loan or to manage the development of the property (administrative or development trust). The law also provides for certain income tax exemptions such as in the case of inheritances, donations from immediate family members, and when the seller can prove by official documents that he has been living on the property as his principal worldwide residence for a certain period of time. To qualify for the “homestead exemption” to Mexican “capital gains” (or income²) tax, sellers (i) must have the proper immigration document (FM2 as opposed to FM3 is usually required) evidencing residence in Mexico, (ii) must be a Mexican taxpayer evidenced by a valid Mexican taxpayer ID (RFC), (iii) must be provide copies of paid utility bills during the required period of time, and (iv) should have a Mexican bank account. Once a seller proves the property subject to sale is her primary residence, the next question is for low has it been so. If the property is sold for less than roughly US$400,000, then the exemption will apply upon a showing that the property has been seller’s primary residence for six months or more. If the sales price is greater than roughly US$400,000, then the seller must prove the property was his primary residence for at least five years to receive the full benefit of the exemption. On the other hand, if the sales price is greater that US$400,000 and the seller can show that the property has been her primary residence for more than six months but less than five years, then the exemption will apply to the first $400,000 (roughly) in income, in which case the seller will have to pay income taxes on the balance only. Individuals or companies purchasing real estate that consists of land or land and improvements thereon located in Mexico, are subject to the payment of a Real Estate Acquisition Tax. This tax is calculated at a rate varying between 2 percent and 3.7 percent (depending on state law) of the value of the property. Purchasers of real property, irrespective of the nature of the transaction or the nationality of the parties, must pay this tax. Most states fix hefty fees payable by the buyer to record his deed in the Public Registry. These fees are usually a percentage of the recorded sale price and range between .25% and 1%. Value Added Tax (VAT) must be paid by the purchaser of structures or buildings destined for a commercial use at the rate of 16 percent of the value of the structure. VAT is not charged on (1) the sale of land only; (2) the value of the land portion of the sale of property including land and structures; or (3) residential property. In the event that only part of the construction is used for residential purposes, VAT will not be paid on the residential part. In any event, parties (particularly sellers) are advised to seek advice from a Mexican tax specialist prior to transferring interest in real property. Property taxes are generally very low in Mexico. Property taxes are assessed and collected by municipal authorities. Although they vary significantly from city to city and depend on the authorized land use, as a general rule of thumb, annual property taxes will not exceed 0.3% of the assessed value of the property. Assessed values (as compared to market values) also vary significantly from place to place, but as a rule of thumb, they will generally be two to three times lower than market value. Undeveloped or “rustic” land will usually have the lowest rate, while heavy industrial zoned land or high-density tourism land will have the highest rate. 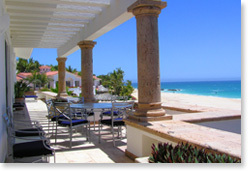 Closing costs in Mexico are usually quite high, as a percentage of the overall purchase price. Although the percentages will decrease as the purchase price increases, after all taxes and fees paid by Buyer are calculated, 5% of the total purchase price is not uncommon. At a minimum, buyers will typically pay: (i) 2% transfer tax; (ii) 1% in notary fees; (iii) 0.75% in recording fees (in Baja California Sur); and (iv) another US$1,000-$5,000 in trust/corporation formation and miscellaneous closing fees. In addition to this, costs will include attorneys’ fees, title insurance policies and reports, and real estate commissions, as applicable. 2. The Mexican tax code does not differentiate ordinary income from capital gains. Therefore, under Mexican law, capital gain from the sale of real estate is treated as ordinary income and taxable at the applicable income tax rate.